A great service that we are able to offer in conjunction with Vets4Pets in Wigan is the Puppy Party. 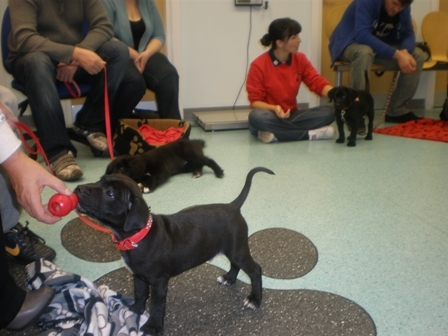 The puppy party is available to puppies that have had just completed their vaccinations and are under 16 weeks old. In this session which lasts for an hour you will be given information that will help you in those first few weeks of puppy ownership, we discuss and give advice on house training, crate training, socialisation & body language, mouthing, appropriate play and much more. There will be opportunity for your puppy to have safe, supervised positive play with puppies of his own age, which is really valuable at this stage and great fun to watch. There is also a goody bag full of useful information and a training booklet. The Puppy Parties run at Vets4Pets Wigan . The cost is £10 per puppy. Your puppy does not have to be registered at the veterinary clinic in order for you to come along and join in the fun. Vets4Pets parties are run by Jo Pay & Hayley Lane. These parties are really popular, so do book well in advance. Thanks. If you would like to know more please get in touch, we’d love to hear from you: email.